Crossing the bridge eastbound into Guadalupe says it all. You drive over the I-10 highway from palm-lined golf courses and luxury adobe condos into empty dirt fields, ramshackle bungalows and hand-painted sandwich boards imploring gang members to give up their guns. “Fear not: love is more powerful than firearms,” reads one. 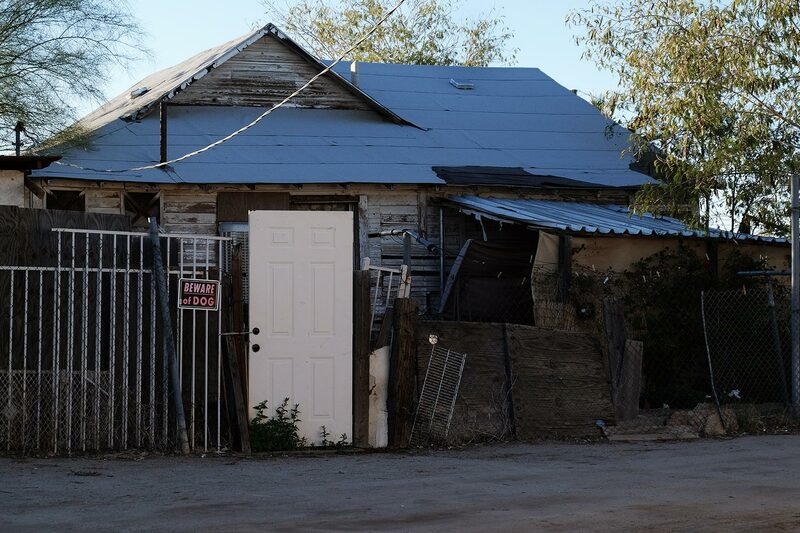 This is Guadalupe, Arizona, and it’s not exactly a place tourists go. 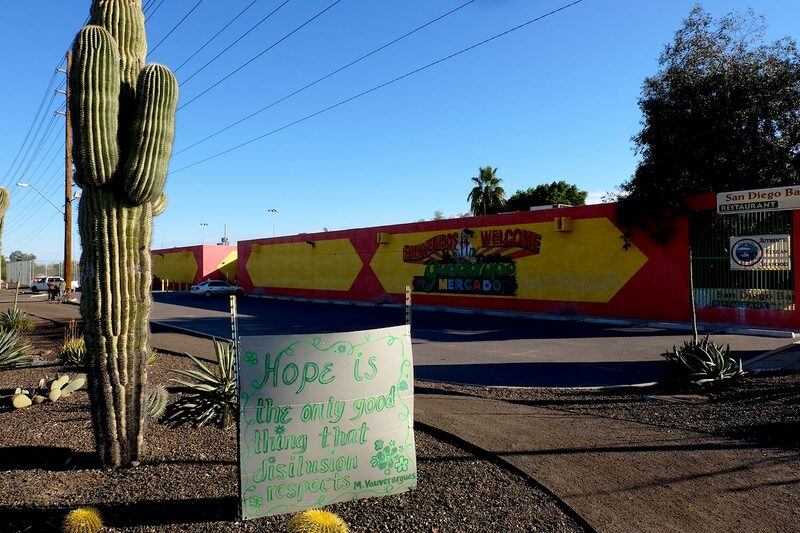 The town of roughly 5,500 people—almost entirely of native Yaqui and Mexican descent—is sandwiched between Tempe and Phoenix, near the greater metropolitan downtown core and the sprawling South Mountain range. If local Phoenicians drive through it at all, several told me, they do so without stopping. More than 30 percent of Guadalupe’s residents live below the poverty line, and in 2008 it acted as a flashpoint between Maricopa County’s notoriously anti-immigrant sheriff, Joe Arpaio, and the local community members—many of whom, ironically, are not immigrants at all, but in fact have family ties to the land long before Arizona joined the United States in 1912. Yet Guadalupe is an utterly unique part of the greater Phoenix area. It bears little resemblance to the suburbs of Ahwatukee or Mesa, is devoid of the high-rise condos sprouting up downtown and lacks the verdant golf courses that line the roads of Scottsdale. 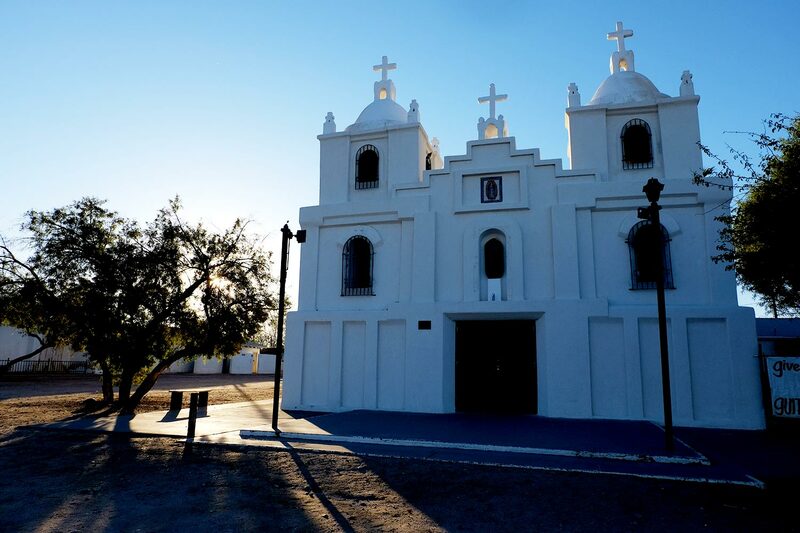 My wife, who’s from Arizona, had been curious about the town for years—its distinct culture, the history of the Yaqui people, whether it’s as rough as Phoenicians say it is. We decided to check it out. The entrance to El Mercado de Guadalupe. Our first stop was the Guadalupe Farmer’s Market, a hip, organic-heavy grocery store at the main intersection of Calle Guadalupe and Avenida Del Yaqui. It’s a friendly local hub, known for emphasizing local stock: jars of homemade salsa and vegetables line the walls, and I briefly considered buying an 11-pound jug of Flagstaff honey for $50. There’s a video on YouTube of a white woman—I note the skin colour because you really don’t see a lot of white people in Guadalupe—who raves about how this is the only place she’ll buy salsa. 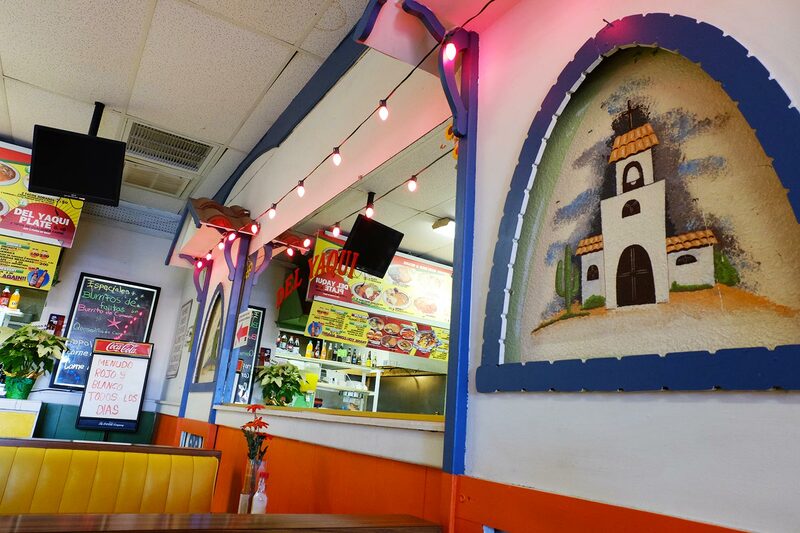 There were a few lunch options, so we settled on Del Yaqui, an authentic Mexican restaurant more colourful than anything else we saw in Phoenix—brightly decorated for Christmas and painted orange, blue, yellow and white. There’s a Spanish-language jukebox in the corner that, if left unplayed for at least 30 minutes, will randomly pick and blast a song on its own—in our case, “El chico del apartamento 512” by the late Mexican pop princess Selena. Del Yaqui’s pull-apart tortillas are worth the visit. I opted for the enchiladas montanas—a fried egg laid atop saucy cheese wraps, as big and hearty a welcome meal as one could hope for. But the fresh, warm, gentle pull-apart flour tortillas that came with my wife’s chicken soup stole the show, and I stole more of hers than she would’ve liked. Guadalupe is in theory a walkable neighbourhood, though in reality there isn’t much to see. The side streets are all residential, and the main drag is lined by empty gravel parking lots with occasional street art and colourful auto-shop signs. But we kept heading north and eventually hit the town’s main draw and only real tourist attraction: Our Lady of Guadalupe Church. 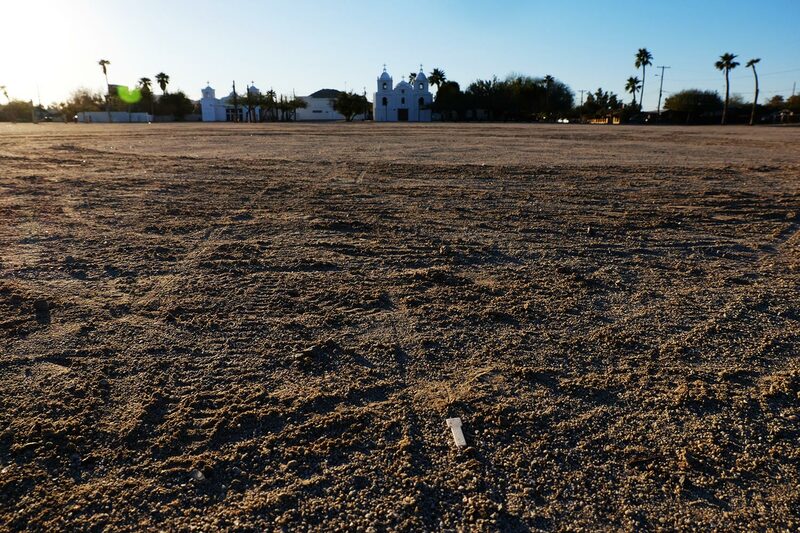 The church is actually two churches—one offers services in English and Spanish, the other in Yaqui—that sit behind a massive, vacant lot of dust. I didn’t understand why they would keep it empty until I spoke with Sheila Garcia, a local mom hanging out with her kids and mother, watching over a boy learning how to ride his bike. A massive dust lot sprawls out from the Our Lady of Guadalupe Church. She explained to me that the biggest event of the year happens here: the celebration of Lent, coloured by the distinctly Yaqui “deer dance”—a ceremonial dance headlined by a man wearing an antler headdress. The whole town gathers here for loud, colourful processions that stream out and back over this now-empty field, during which time everyone is invited to watch, though there are costly fines preventing anyone from taking photos or videos. “It’s beautiful, what this little town stands for,” Garcia told me. But while Lent is the best time to visit, she emphasized to me, that doesn’t mean the town disappears the other 51 weeks of the year. A house behind Guadalupe’s main church. My wife and I drove around the neighbourhood after that, peering out the windows at people fixing their cars, hanging out on their porches or just standing behind their fences, watching us drive past. It suddenly occurred to me how odd it was to see people outside at all—one of Phoenix’s defining characteristics is its lack of pedestrians. Not here. We chatted about this that afternoon over craft beers at the Huss Brewing Company, two blocks south of Guadalupe proper, in Tempe. The brewery is tucked away in a distressingly boring business park—there’s literally an envelope factory around the corner—but the beers were sharp and fascinating, including a strongly scented coffee bean–infused blonde and creamy milk stout. The crowd was mostly white folks who seemed to have just gotten off work. Huss proudly bills itself as the state’s “first yoga studio in a brewery,” and my wife and I passed some time filling in paisley designs in one of their adult colouring books. Technically, yes, at that moment, Guadalupe stood just two blocks north of us. But in reality, it’s a world apart from the rest of Phoenix.